Of all four scarf designs produced so far, the inspirations for the 'Compass Rose' design had to be pared down the most. In this case, it wasn't so much a matter of finding reference material, but of trying not to drown in it. Each individual piece I found was usually daunting in its skill and complexity, and the overwhelming nature of the search only multiplied when I began to realize that exquisite examples of decorative ornamentation pertaining to the history of illuminated maps span multiple centuries' worth of aesthetic movements. As someone attempting to appropriate these styles, this knowledge both inspired and haunted me as I waded through image after image of masterfully executed material. In order to get through it, I needed to take a step back and select a focus. This is where inspiration boards come in. The real impetus for this design was the delicate, almost floating quality found in the compositions of the Regency style—specifically the era's characteristic arabesque panels (shown on the bottom left and right of my inspiration board). The references available for decorative elements held example after example of compositions so full and dense, so flourished and elaborate, that it was very tempting to turn down an increasingly Rococo path. It was imperative that I continued to remind myself that my end goal was much more restrained: the somewhat spare, panel-oriented compositions that sparked the initial flicker of the 'Compass Rose' design. This is why composition references are highlighted on my inspiration board much more than any of exquisite detailing that could've been included. The inspiration board I created in order to focus the mood of the 'Compass Rose' scarf's design. The inspirations behind the 'Compass Rose' design fall into two main categories. The first addresses subject matter, for which I looked mostly to illuminated maritime maps (to which I have an entire other blog post dedicated, here). 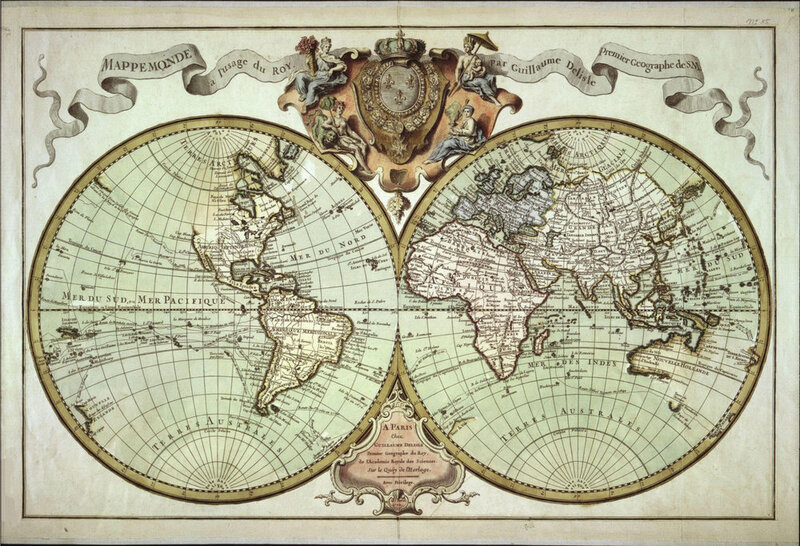 Within this, there were two main elements that intrigued me: the mythological creatures that frequently adorned these maps, and, of course, the compass rose. I did also reference this style for some composition elements, although mainly just for ideas of how to incorporate decoration and how to best utilize the compass rose motif. As you can see, in general, they inherently have a much more organic layout than the somewhat austere, symmetrical compositions I had in mind. A map of the islands of Java, Sumatra, & Borneo, circa 1747, from Bartele Gallery. 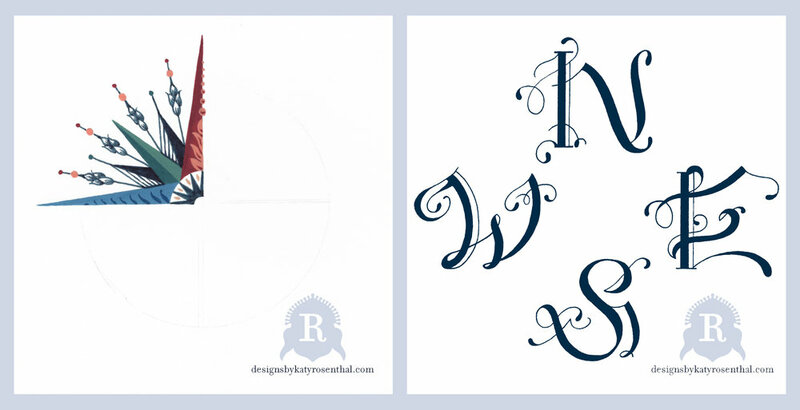 Original motifs created for the Compass Rose Scarf—on left, the compass rose itself, which was painted as a quarter and then copied and rotated to complete the circle on Photoshop. On right, my lettering designs. The Constellations for Each Month in the Year, engraved by W.G. Evans for the 1856 edition of Elijah Burritt's Atlas Designed to Illustrate the Geography of the Heavens., shows the stars of the Southern Hemisphere. My original drawings for my invented "mythological" creatures. On top, "Bendira," and on bottom, "Cleofin." 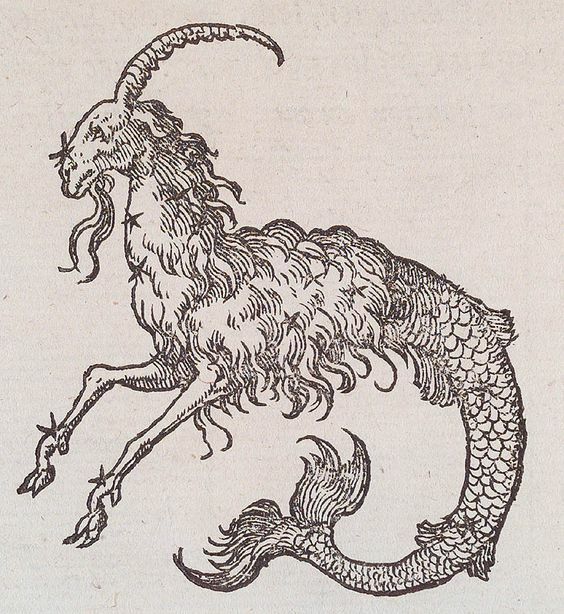 Bendira is a composite of a Red Crowned Crane's head, a lion's body (styled after how lions were typically illustrated in engravings from the 16th century, the time period during which most of the maps I was looking to for reference were made), and a horse's tail. Cleofin is a deer (stylized in the same manner) with a tail and plume inspired by those of a peacock. The original drawing for my invented creature, "Nymra," which are essentially butterflies whose wings are composed of seashells. 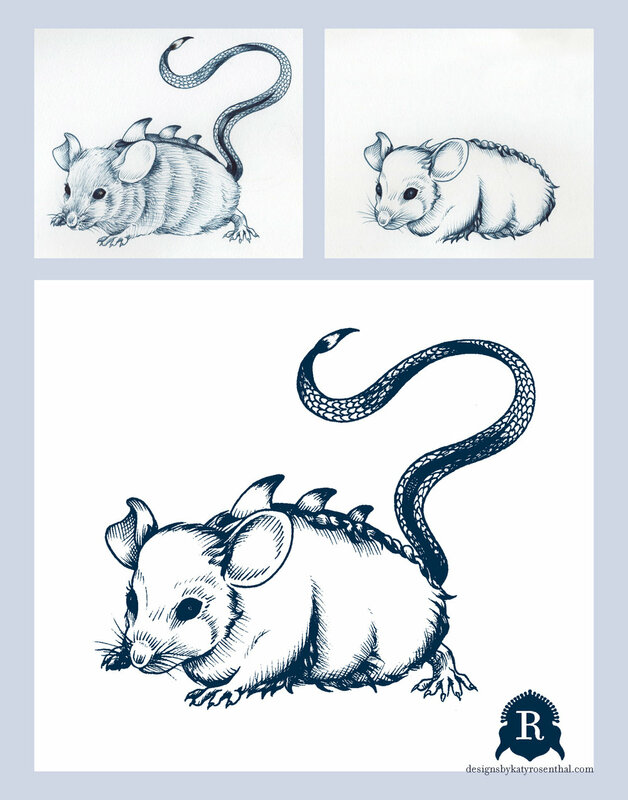 The process for creating "Tionae," my invented take on a mythological mouse with the horn-ridged back and scaly tail familiar to the lore of dragons. In the first drawing, I was happy with the general shape and the invented, dragon-like elements, but not with the rendering of the fur. I traced over the original and redrew the aspects I felt needed changing, splicing the two drawings together on Photoshop to achieve the final version shown on the bottom. I have always loved the look of labeling in these more diagrammatic mediums, and I knew that I wanted to incorporate that into my design. 'The Soap Tree Tribe,' illustration from Illustrations of the Natural Orders of Plants with Groups and Descriptions by Elizabeth Twining. Published London, 1868. Image from the Biodiversity Heritage Library. The botanical illustration above exemplifies the type of script I was looking at for reference in creating my "scientific" labels for my imaginary beasts. The original scan of my handwritten lettering, naming each of my invented creatures. The second main category of inspiration pertained to composition and decorative elements to arrange and supplement the subject matter. As I mentioned earlier, for this I looked primarily to panels from the Neoclassical-influenced Georgian era, particularly in the Regency style. Image from Strawberry Milk blog. Left: A decorative panel, French, 1785. From the Musee des Arts Decoratifs. Right: A photo of decorative, gilded, carved wood paneling at Versailles, taken by Robert Polidori. Design for grotesque arabesque panel, etching by Jacques Androuet Du Cerceau, 1550. From the Victoria and Albert Museum. Arabesque panel inspired wallpaper designs by French manufacturer Jacquemart et Bénard, active 1791–1809. Painted and gilded oak panel, Pierre-Adrien Paris. French, 1747–1819. From the Metropolitan Museum of Art. Left: Villa Valguarnera, image from Conde Nast Traveller. Right: Paul Montgomery Studio's Woodham design, inspired by Robert Adam's works from the Georgian era. Original motifs I created for the 'Compass Rose' scarf design. As both elements were intended to be symmetrical, I rendered them in halves and mirrored them on Photoshop. On left, a multi-colored decorative element drawn from the Regency style. On right, a more generally Neoclassical design inspired by three-dimensional architectural embellishments. The final source of inspiration that ended up literally bridging the gaps of negative space in the design was the almost candy-striped look of the tented ceilings that kept popping up in the interior design recesses of my Pinterest, themselves very referential of Medieval encampments—a time when decorative maps would have been very relevant. The whimsy of bringing this very outdoor, temporary structure into more permanent, residential spaces had been catching my eye and felt like just the right touch to unite my composition. What enchanted me during this research process was the ceremonious treatment of wonder. The same spirit that sparked the imaginations of those charting worlds yet unknown to them is also what compelled the artisans of their time to honor these documents by transforming them into treasures through the alchemy of their masterful adornments. I hope this comes through in the final design for my 'Compass Rose' scarf, and that it appeals to all those who appreciate the fanciful nature of these aesthetic movements. The 'Compass Rose' design in its final scarf form! Printed with GOTS-certified organic inks on organic ahimsa silk.